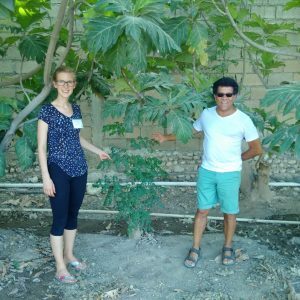 Vanessa Pike travelled to Port-au-Prince, Haiti in August 2016 to co-lead a Moringa-Breadfruit Symposium that promoted community partnerships to grow, process, cook and market these nutritious crops both in Haiti and abroad. 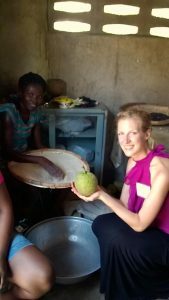 “My classmate who worked as a physician in Tanzania knew of my interest in global nutrition solutions and recommended I read up on a tree called Moringa oleifera,” said Pike, a recent graduate from the MPH Nutrition and Dietetics program. Chronic malnutrition affects one in every five children in Haiti and micronutrient deficiencies are widespread. About half of Haitian households are food-insecure. Although 60 per cent of the population works in agriculture, most of Haiti’s food is imported, including the majority of its staple: rice. This imported, subsidized food makes it difficult for local farmers to compete. In 2013, a working group in Haiti’s Ministry of Public Health and Population called for the large-scale production of moringa as a strategy to address malnutrition, but its recommendations have not yet been implemented. To help address the Ministry’s recommendations, Pike partnered with Gabriel Osson from Toronto’s Haitian community and the Trees That Feed Foundation to organize two symposiums that connected local farmers, agronomists, NGO staff, and students around the nutritional and economic benefits of moringa and breadfruit trees. The symposium also featured locally-prepared dishes featuring these two ingredients for the participants’ lunches. “The symposium was a springboard for community members to learn how to leverage the crops’ economic, nutritional and ecological potential, which can help reduce malnutrition, provide sustainable, long-term income to small farmers and restore forest cover in Haiti,” said Pike, who was supervised by Professor Ann Fox, former Master’s Graduate Coordinator and Nutrition and Dietetics program director. In addition to Fox’s guidance, Assistant Professor Erica Di Ruggiero taught Pike how to refine goals and anticipate challenges in implementing the project during her Population Health Intervention Research course and is proud of her success. “Vanessa developed a powerful pitch on the health, economic and social benefits of the Moringa oleifera trees and I’m proud of her successful community mobilization efforts that helped to promote its consumption as an acceptable food choice in Haiti,” said Di Ruggiero.